Mimuzuka is the memorial;ToyotomiHideyoshi had constructed to hold the ears and noses of some of the 38,000 Koreans who had been slain during the 7th year war fought between the Korean and the Japanese. It literally means Hill of Ears or Ear Mound. 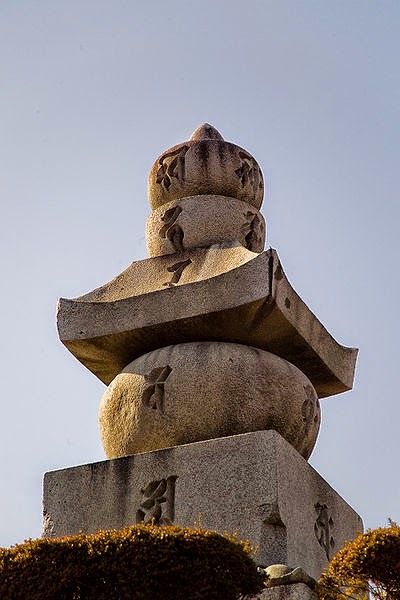 The reason for the memorial which was dedicated in 1597 is not known and some say Hideyoshi wanted to honour the Korean soldiers who were slain while others say that he meant it as a warning for Japan’s enemies not to resist conquest. According to tradition, Japanese warriors had to return with the heads of their slain enemies though the distances involved between the two made this unreasonable and hence they cut off their ears and noses as a confirmation of their deeds to receive rewards. Their facial parts were placed in barrels of brine and returned to the Imperial capital and due to several barrels which were discarded; it will never be clear how many Koreans perished in Hideyoshi’s invasions. Some historians have made an estimate between 40,000 and a million on the Korean alone. Ultimately Hideyoshi’s war seemed meaningless and Korea was abandoned after his death. Towards 1970, the Korean government called for the levelling off the mound which according to them meant nothing more than Japanese cruelty and brutality. The mound was topped with a Sanskrit inscribed stone stupa and is next to a nondescript playground on a street leading to the tori gate of the shrine where the mound and the shrine form ironic neighbours for the man who was the cause of the death of thousands of Koreans and the Buddhist burial site which was dedicated to them and the Toyotomi Hideyoshi is enshrined at this place. Mimizuka’s original name was Hanazuka or Nose Mound since this was the limit which denoted a dead Korean whether he was a soldier or a hapless non-combatant. According to Tadashi Takahashi of the Nippon Christian Academy Kansai Seminar House states `the reason that the grave was called `ear grave’, though there were more noses than ears is the good proof of Japanese government’s cunning strategy since the image of cutting off one’s nose was much more cruel or inhuman than the image of cutting off ears’. He further claimed that the Japanese Government tried to portray Mimi-zuka, in the early 20th century, as a symbol of Hideyoshi’s mercy for mourning the souls for the Koreans though he dismissed this as government propaganda to create Hideyoshi as a merciful hero. As per the New York Times article, some Japanese debated that Koreans and Chinese greatly exaggerated the scale of the suffering and in any case atrocities were simply an unfortunate part of any war. At one point of time, there was a plaque in front of the ear mound which read `One cannot say that cutting off ears or noses were so atrocious by the standard of the time’.The article further explains that the Koreans had different views on what had to be done with the mound. While some of the officials of Park Chung Hee, the dictator of South Korea in the 1970s, urged that the Ear Mound be levelled since it was shameful for Korean, there were others who suggested that the mound be relocated to Korea to soothe the spirits of the dead. Most of them were of the opinion that the mound should stay in Japan as a reminder of past savagery and Japan has been treating the Ear Mound as a national landmark and were unwilling to return it.